In The History of Archaic Rome, Dionysius purposely viewed Roman history as an embodiment of all that was best in Greek culture. 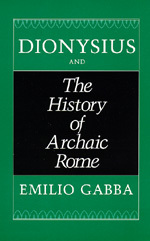 Gabba places Dionysius's remarkable thesis in its cultural context, comparing this author with other ancient historians and evaluating Dionysius's treatment of his sources. In truth, the last decades B.C. made the historian's task an enormous challenge. On the one hand, the ancient writers knew Rome to be the greatest empire the world had seen, seemingly impregnable in military power and still capable of expansion. On the other hand, they were acutely aware that it recently had barely survived half a century of civil strife. Gabba recalls to us how little was confidently known of Rome's actual origins in an illuminating examination of Dionysius's methodology as a historian. Emilio Gabba is Professor of Roman History in the Dipartimento di Scienze dell'Antichità at the University of Pavia, Italy. He has published widely on the social and political history of Greece and Rome. His book Del buon uso della ricchezza: Saggi di Storia Economica e Sociale del Mondo Antico (Milan: Guerini e Associati) appeared in 1988.